Blakeman is pleased to provide you with our January newsletter to help keep you up to date on important changes and new regulations within HR, DOT, safety and more. If there is any topic you would like more information on, feel free to call us or simply respond to the e-mail. We are here as a resource -- to increase your compliance, productivity and efficiency. to reserve a class for yourself or for your employees! Blakeman & Associates is approved by the Health & Safety Institute (HSI) to provide Medic First Aid CPR training to employees in any industry. We also have the benefit of being able to train our own CPR trainers, giving us the flexibility to accommodate training needs of any size. CPR trainees can come to our office or we can conduct on-site training in either English or Spanish. Our instructors are more than qualified to provide excellent training, with documented, certified training and a unique ID number. Additionally, Blakeman’s CPR trainers are adaptable to train in any workplace environment, whether a professional office or the machine shop next door. If you fall under the posting requirements, you must post the 300-A summary no later than February 1 of the year following the year covered by the records and keep the posting in place until April 30th. ​**For the sake of your employees, use discretion when posting sensitive medical information. For more information regarding the details of completing, certifying, and implementing the summary, click here. 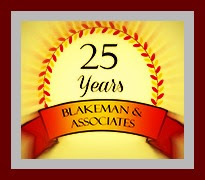 If you have any questions regarding OSHA 300 logs or if you would like help with this process, contact Blakeman & Associates. Employers subject to the Affordable Care Act’s 2015 information reporting requirements now have extra time to give forms to employees and to file them with the government. For furnishing employees with the 2015 Form 1095-B (Health Coverage) and Form 1095-C (Employer Provided Health Insurance Offer and Coverage), the deadline is extended from Feb. 1, 2016, to March 31, 2016. For filing with the IRS the 2015 Form 1094-B (Transmittal of Health Coverage Information Returns), Form 1095-B, Form 1094-C (Transmittal of Employer-Provided Health Insurance Offer and Coverage Information Returns) and Form 1095-C, the deadline is extended from Feb. 29, 2016, to May 31, 2016 if not filing electronically, and from March 31, 2016, to June 30, 2016 if filing electronically. Any employer filing 250 or more forms must do so electronically. The notice also provides guidance to those who might not receive a Form 1095-B or Form 1095-C by the time they file their 2015 tax returns. SHRM recommends earlier filing to ensure compliance with the due dates. For more information on this topic, click here. "On December 16, the Federal Motor Carrier Safety Administration (FMCSA) published a final rule in the Federal Register requiring the use of electronic logging devices (ELDs) for drivers required to prepare hours-of-service records of duty status. According to the agency, approximately three million drivers will be impacted. Keep reading to find out how." "The FMCSA believes the use of ELDs, which synchronize with a vehicle engine to automatically record driving time, will improve compliance with hours of service (HOS) rules by reducing the paperwork burden for motor carriers and drivers and by increasing the efficiency of law enforcement personnel in reviewing driver records. The agency estimates that the rule will save 26 lives and prevent 562 injuries annually." Visit our page addressing ELD requirements to learn more. If you don't see the service listed that you need, call us and we will figure out how best to help you. Have questions regarding our services? If you don't find it on our website, give us a call or send an email and we will let you know how we can help.